To investigate environmental variability during the late Holocene in the western Gulf of Maine, USA, we collected a 142-year-old living bivalve (Arctica islandica) in 2004, and three fossil A. islandica shells of the Medieval Warm Period (MWP) and late MWP / Little Ice Age (LIA) period (corrected 14CAMS = 1030 ± 78 ad; 1320 ± 45 ad; 1357 ± 40 ad) in 1996. We compared the growth record of the modern shell with continuous plankton recorder (CPR) time-series (1961–2003) from the Gulf of Maine. A significant correlation (r 2 = 0.55; p < 0.0001) exists between the standardized annual growth index (SGI) of the modern shell and the relative abundance of zooplankton species Calanus finmarchicus. We therefore propose that SGI data from A. islandica is a valid proxy for paleo-productivity of at least one major zooplankton taxa. SGIs from these shells reveal significant periods of 2–6 years (NAO-like) based on wavelet analysis, multitaper method (MTM) analysis and singular spectrum analysis (SSA) during the late Holocene. Based on established physical oceanographic observation in the Gulf of Maine, we suggest that slope water variability coupled with North Atlantic Oscillation (NAO) dynamics is primarily responsible for the observed SGI variability. 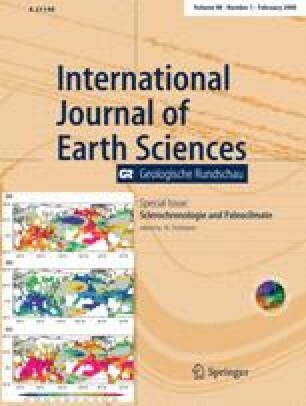 Special Issue: AGU OS06 special issue “Ocean’s role in climate change—a paleo perspective”. We thank Dan Belknap and Joe Kelley (University of Maine) for the fossil shells from vibracore SBVC9609, David Rodland and Sven Baier for their help in preparing shell samples (INCREMENTS Research Group, University of Frankfurt), NOSAMS at Woods Hole Oceanographic Institution for AMS analyses, and the Association of Graduate Students (AGS) at the University of Maine for travel funds to the University of Frankfurt. The NOAA (Ocean-Atmosphere Research/Earth System Research Laboratory/Physical Sciences Division, Boulder, Colorado, USA, (http://www.cdc.noaa.gov/)) provided the Kaplan SST V2 dataset. This paper was improved by comments and suggestions from Fred Andrus and an anonymous reviewer. This study has been made possible in part by a German Research Foundation (DFG) grant (to BRS) within the framework of the Emmy Noether Program. This research was funded through National Science Foundation (NSF ATM-0222553).